A few of you may have seen stories circulating late last week and this week about problems with electronic voting machines in Arkansas. According to KARK news, at least one person who voted early reported that when she used the touchscreen voting machine to cast her ballot, the machine misread her vote; instead of marking the candidates she selected, the machine marked the candidates’ opponents. In this particular case, KARK writes, the woman voted for several Republicans, but the machine recorded the votes as being for Democrats. According to election officials, electronic voting machines have to be calibrated in order for the touchscreens to work properly. As the machines are used over and over again, those calibrations can change and the machines begin to malfunction. The lesson here is regardless of whether you are using a paper ballot or an electronic one, always review your ballot carefully before you submit your vote. If you incorrectly mark a paper ballot, you should be allowed to get a new ballot from a poll worker. If you spot a mistake on an electronic ballot, you should be able to correct it before submitting your vote. According to the Secretary of State’s website, electronic voting machines offer two ways to review your ballot before you submit it. The first is on a “Review” screen; when you are done marking candidates, you simply click “Review” and review your vote in much the same way you might review a purchase on a website before actually submitting your purchase. The second is on a paper receipt to the left of the touchscreen. 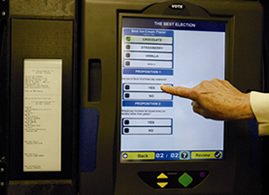 The electronic voting machine prints out a paper receipt with your votes recorded on it. When you review your votes on the screen, I would suggest also reviewing the paper receipt to make sure they both match with how you voted. If you spot a mistake, follow the instructions on the screen to correct it or ask a poll worker for help. And after you’ve corrected your mistake, review your ballot again–just to make sure the machine accurately recorded your correction. Reviewing your ballot is simply another part of voting responsibly. If you spot a problem with a ballot or if you think an electronic voting machine may be malfunctioning, notify a poll worker immediately. Update: KATV reported last night that Pulaski County has received about a dozen of complaints of “vote flipping,” with votes cast for one candidate being recorded for the candidate’s opponent. Similar reports have come out of Lonoke County and Franklin County. Election officials are recalibrating voting machines daily and encouraging every voter who uses the machines to verify their ballot before submitting.